Do It Like Doli: Hide Your Unsightly Modem/Wireless Router! 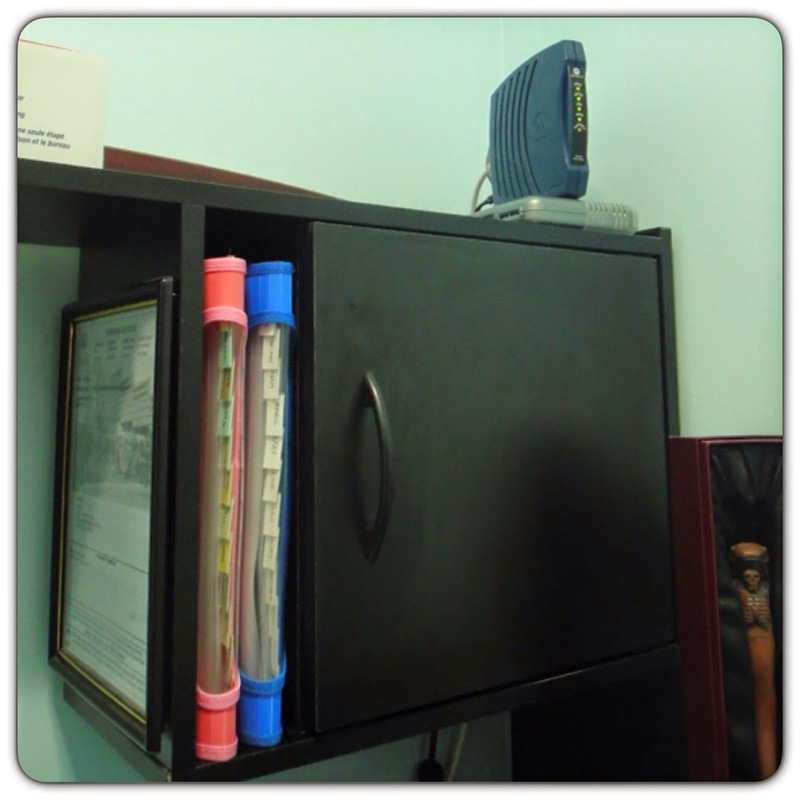 Do you have a modem or router taking up space in your office as an eyesore? Tried everything in your power to make them look good? Have you tried stacking them in different combinations to make them look less ugly? Well folks, I stumbled across a post somewhere (must have been pinterest) and found a solution! Using a nice decorative box, the problem of hiding unsightly modems and routers is solved, brilliant! I just happened to have an extra box that was just sitting in storage so I put it to good use. All I used was an X-Acto knife to cut out a notch in the bottom of my box so I could thread the wires through. Now depending on the placement of your box, you may need to cut out a notch in the side, or back, etc. but because the back of my box hangs over a space between my wall and my desk, a bottom notch seemed to make the most sense. You should coil the wires in the box so they fit nicely and don't make the lid pop off...I kinda just shoved everything in there haphazardly and it seems to have worked! Here's my nice little box sitting neatly in the corner. I ended up labeling the box "Modem/Router", because well...while I'm 60% creative...I'm 100% practical! This project took less than 10 minutes to make yet it makes a world of difference...well...if I wasn't having wi-fi connection issues and issues with my printer, it actually would have only taken less than 10 minutes compared to the 1.5 hours it really took, grr. I just wanted to make a note that my router does heat up and is very warm, so the thought of putting both units in one box with a lid over top did concern me. I've only had this storage solution for a week or so and I am monitoring it whenever I am home (leaving the lid off when I am at work until I feel 100% comfortable). The lid feels slightly warm to the touch but there doesn't seem to be any other reason for concern, if you can cut more holes in the box to provide better ventilation it may be ideal. But right now I'm a happy camper!